In a moving performance, Melbourne singer-songwriter Didirri performs two songs, Blind You and Formaldehyde at TEDxSydney 2018 Didirri’s challenging and thoughtful writing has won listeners around the world. 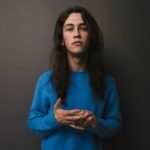 Weaving through uninhibited, relatable, and sometimes political lyrics, and with a penchant for impromptu mid-set banter, Didirri breaks down the walls between audience and stage. Simultaneously heartbreaking and healing, and approaching real issues with smile and charm, Didirri is an artist with something to say.